Chemistry for kids is about learning the chemical elements, conducting basic chemistry experiments and learning how a substance can be transformed into another in a chemical reaction. 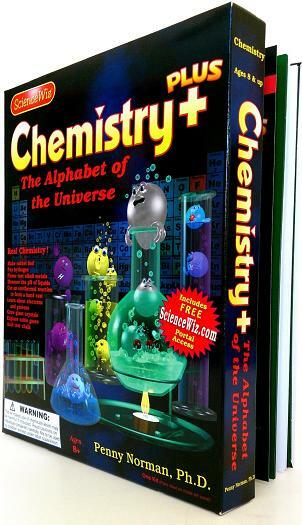 There are chemistry games that can get children really excited about chemistry and science. Most of these chemistry games consist of chemistry kits or chemistry labs. The chemistry kits usually include test tubes, various instruments used by chemists such as scoops and special cups, and different liquids (for example, acids like citric acid) in order to conduct experiments. There are also chemistry books for children and beautiful photo cards that explain chemical processes. Posters with the periodic table of the elements help kids learn about the different chemical elements and can be hung on a child’s bedroom wall. We also recommend a website called Experiland which has lots of science projects and experiments for kids. Chemistry kits for kids usually include manuals with instructions that also explain each experiment being conducted. We recommend two kits that are very popular and that have also received numerous awards: the Mind Blowing Science Kit by Scientific Explorer and the Chemistry Plus Experiment Kit by Science Wiz. The Scientific Explorer's Mind Blowing Science Kit for Young Scientists is for children ages 5-8 (see on Amazon here). The chemistry set gives children a taste of science and chemistry. All the experiments are relatively simple. Children learn about the difference between liquids that are acidic and those that are basic. They also learn how to use a test tube and conduct various interesting experiments. The set includes all the important supplies in order to run chemical experiments. It also includes a manual that explains how to conduct the experiments step by step with interesting explanations of what's happening in each experiment. No prior chemistry knowledge is required to conduct the experiments. The Science Wiz Chemistry Plus Experiment Kit is for older children (ages 8 to 15). It is more advanced and the chemistry experiments are more sophisticated. Just like chemists, kids use a flame test in order to identify an alkali metal, they measure the pH of liquids, they conduct a pop experiment with hydrogen, they look for protons and they even grow crystals. The set includes a detailed manual containing instructions, nice illustrations which explain each experiment. This chemistry kit teaches children the periodic table and some fundamental scientific concepts. We recommend adult supervision when playing with these kits because some experiments can become complicated noting that all experiments are designed to safe. Don’t be surprised if you also develop a passion for chemistry as you play with your kid with one of these chemistry sets!